Alvarion is the world’s largest pure-play provider of broadband wireless networking infrastructure for carriers and service providers. Celebrating over ten years of expertise in the wireless solutions arena, and with installations of over 1,500,000 units in 130 countries, Alvarion has acquired the largest share in the world’s Broadband Wireless Access market. Alvarion’s carrier-grade solutions operate in all popular frequency bands offering integrated high-speed data and toll-quality voice services. 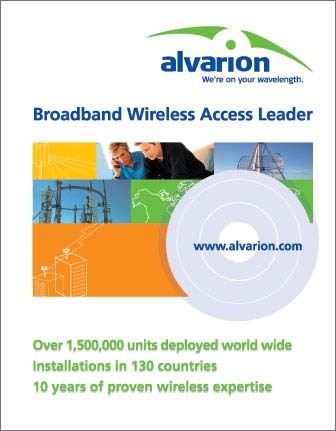 Featuring the industry’s most extensive range of products and international support, Alvarion is a pioneering leader of the converged wireless broadband network. With According to a recent Pyramid Research Report, “WiMAX and Wi-Fi: Unwiring the World” (11/03), Pyramid estimates that “WiMAX could realistically surpass 50% market share by 2008.” The report also states that Alvarion has a market share of 45%, making it the largest equipment vendor in the Broadband Wireless Market. From simple POTS to multi-service broadband applications, Alvarion is a one-stop shop for everything in the world of fixed wireless. Alvarion provides solutions for all frequency bands (from 900 MHz to 28 GHz) and addresses all data and voice services, for every end user profile, from the growing residential and SOHO (small office, home office) markets, up to SMEs (small and medium enterprises) and MTU (multi-tenant units). Alvarion product families are built in a highly modular and flexible way, such as to best support the operators’ need for "pay-as-you-grow" investment scalability. In line with Alvarion’s technological approach, all product families are designed to be maximally "transparent" (to the user’s network hardware and software, to the user and to the system administrator) and to enable smooth integration. The successful implementation of this concept pre-empts the need for the user to acquire deep expertise in the radio field, thus preventing unnecessary efforts and costs that would disturb the user’s organization focus on its core business. Our extensive product range is suitable for all applications (last mile access, network bridging and backhauling), and all services (toll quality telephony, IP overlay, multi-service network, and VoIP). Moreover, they cover the complete spectrum of licensed and unlicensed bandwidths, so that regardless of the region served, carriers and service providers can find a cost effective solution that leverages available frequency to the maximum. Throughout the past decade, Alvarion has maintained a vigorously stable and clear agenda in the face of the turbulent waters that have flooded through the global marketplace. Our vision has been consistently accurate and we have persevered, weathering the storms that have affected the wireless arena to emerge as the industry’s foremost leader, confidently and gracefully poised at the pinnacle of the BWA pyramid. The opportunities presented by the establishment of the WiMAX forum, advocating the widespread compliance with the 802.16a Wireless MAN standard and the establishment of guidelines for system and component interoperability, presents the telecom industry with compelling advantages in integrating BWA into their future agenda. Alvarion is proud to be the first BWA vendor to work in conjunction with Intel on producing a product line that integrates WiMAX-based technology. By merging our respective, industry leading strengths, we intend to live up to the promise of a stable, interoperable standard as set forth in the WiMAX mission. The current direction of the market validates our good judgment and long-term vision. We have produced the finest and most durable BWA systems available in the market, offering carriers and service providers truly scalable solutions that forge a clear migration path to new and lucrative market opportunities as they arise. We have the foresight to predict and adapt to change and translate it into bottom-line benefits for our partners and for ourselves. Leading the industry with a proactive view to standardization and equipment interoperability while concurrently offering cost effective solutions, Alvarion consistently leverages its vast R&D resources and field-proven experience to enable its customers to succeed in implementing their business plans. True to our corporate creed – We’re on your wavelength, forever attuned to your needs and the shifting tides of a dynamic telecommunications market. We look forward to deepening the fruitful and long-term relationships we have cultivated in helping our customers to realize the inherent promise of BWA. Alvarion’s industry leading expertise and vast experience as a pure-play wireless vendor makes it the logical choice to be the first to work in conjunction with Intel on producing a product line that integrates WiMAX-based technology. By merging our industry leading strengths, we hope to live up to the promise of a stable, interoperable standard as set forth in the WiMAX mission. The Alvarion-Intel WiMAX system cooperation is a strategic relationship launched by the two vendors to produce superior wireless chips (Intel) and systems (Alvarion) that will serve as a benchmark for all other wireless vendors as they move towards a comprehensive adoption of WiMAX. Intel is designing the chip, guided by our system definition and design, which will be incorporated in our product line over the coming year. Subsequently, Alvarion will be the first-to-market in introducing standardized WiMAX-based equipment and is expecting to ship systems as early as the second half of 2004. Establishing standards in any industry is crucial to its long-term success. In the BWA arena, adherence to the standards set forth by the internationally – recognized professional bodies that devise them, will undoubtedly serve as the ultimate litmus test for the communications industry’s faith in this powerful and practical technology. Alvarion is privileged to have played a significant and proactive role in every standards board that has cultivated the establishment of industry protocols. We have been helping to forge the future direction of the BWA community since its inception, working harder than any other broadband wireless vendor to grow the industry and often donating technology to advance the cause through standardization. We are proud to be a primary driver in enabling the technology’s increasingly widespread acceptance. Alvarion embraced the arrival of the WiMAX forum from the beginning " a relatively new industry alliance whose mission it is to ensure the integrity and proliferation of the 802.16a standard for Wireless MAN " and hold the two vice-presidency chairs of this prestigious organization. Our involvement with standards compliance is nothing new; Alvarion also Chairs the ETSI BRAN HiperMAN alliance and sits on the Board of the Wireless Communication Association (WCA) where it serves in several key capacities. The Company has also been a major contributor in the drafting of mobile PHY/MAC features of the wireless protocol and in creating the definition profiles for 802.16a. The WiMAX (Worldwide Interoperability for Microwave Access) Forum is a non-profit trade organization, founded in April 2002 by leading vendors of wireless access equipment and telecommunications components. WiMAX’s mission is to lay the groundwork for an industry-wide acceptance and implementation of the IEEE 802.16 and HIPERMAN standard, covering the 2-11 GHz bands for Wireless Metropolitan Area Networks (Wireless MAN). WiMAX hopes to jump-start this crucial industry by establishing rigorous definitions for testing and certifying products for interoperability compliance. Our unwavering commitment to standards advocacy continues to bear fruit in the marketplace and will no doubt significantly impact the acceptance of BWA as new opportunities keep on developing on the broadband services horizon.